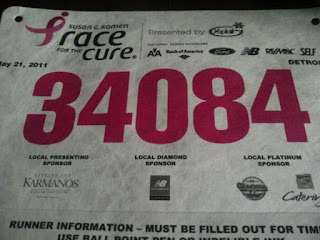 Today, I am walking 5K for the cure of breast cancer. I'm walking in celebration of survivors and in memory of my grandmother, Cookie. For more information, visit Detroit Race for the Cure online. To learn more about the founder of Susan G. Komen for the cure, I recommend reading her memoir Promise Me: How a Sister's Love Launched the Global Movement to End Breast Cancer . Chickadee, yes the both of you were there in spirit walking right beside me. When I was ready to take a break, I just heard your voice saying, "Don't stop! Keep walking!" Then I looked at all the survivors around me and was motivated. Next year, it is on!! !